AMAC handles the logistics to have your lasher moved to and from the factory without the headaches and hassles of transportation, border crossings or foreign exchange rates. Our technicians are capable of providing high-end cable lasher repair services in and around the GTA. The team at AMAC Equipment have decades of combined experience and work for a company that has over 50 years in the industry to boast of. We also have an inventory of parts such as pull tape that is diverse enough to meet the repair needs of multiple cable types and companies. We offer premium cable lasher repairs in and around Toronto, with service being our highest priority. In our philosophy, customer service is our main point of focus. Because of this, we provide fast service teams, quick repairs, and a concentration on reducing the delays experienced because your cable lasher repairs are taking too long. It is a common enough issue for cable lashers to need repairs and preventative maintenance at regular intervals. We provide pull tape, lasher repairs, and many other services, all of which when done together with the professionalism AMAC Equipment has to offer can be translated into quick, effective turnaround for all your cable lasher repair needs. Complete part inspection and testing to ensure all components are in optimal operating condition. Part replacement if faulty or worn parts are discovered. 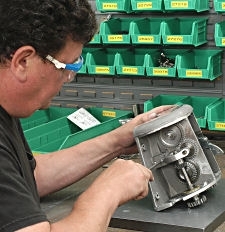 Part repairs for salvageable components by our experienced service team. Post-repair testing to ensure cable lashers are back to full 100% operating efficiency, or as close to it as can be achieved. Talk to our team at AMAC Equipment for options in cable lasher repairs including pull tape supply and more today. Our first-rate customer service standards and experienced personnel can take your old lashers and turn them brand new again.